If the Lexus LC, a car seemingly driven straight out of that weird Jupiter Ascending movie everybody already forgot about, isn’t already enough to catch your attention for some reason, there’s now a bright yellow limited edition that should do the trick. 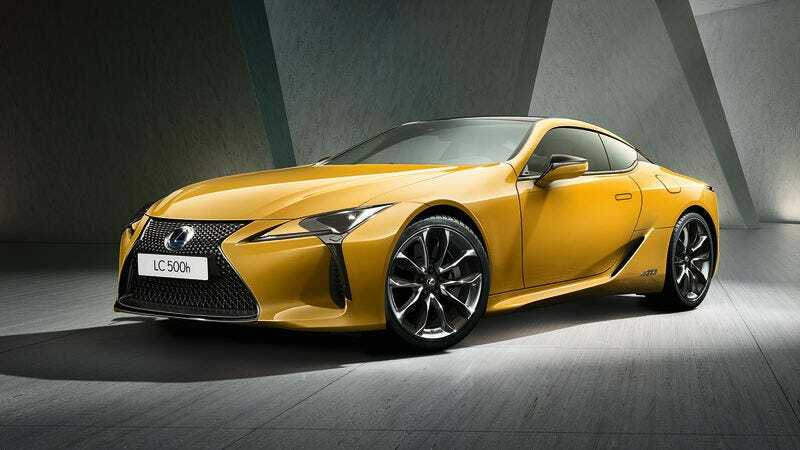 As exciting and inspiring as the intriguing design may be already, Lexus is dipping it in a sea of a rich yellow color, officially “Naples Yellow,” for a new limited edition, and in a genius way, it’s just called the Lexus LC Limited Edition. What’s even cooler is the yellow treatment on the interior, which makes me feel like I’d be sitting in a car upholstered by the flesh of a gargantuan honey bee, but like, in a comforting way. There’s also yellow stitching at least pretending to do the job of holding everything together. Interestingly enough, there are already plenty of images of a yellow LC floating around (without the yellow interior trimmings) with what seems to be temporary license plates and listed as the 2018 model year, but the online configurator, at least in the U.S., has no such option available. The Limited Edition will be specified basically as the typical “Sport+” trim package, with a limited-slip differential, carbon roof, rear-wheel steering system, and those bug-like freaky 21-inch whees. We loved the LC 500 we get in the states when we reviewed it last summer, as its the rare car that feels like it followed through on its future-forward concept themes and delivered an eye-catching sci-fi V8 grand tourer wonder. What’s less cool is that it seems to be a UK-only special after it debuts officially at the Paris Motor Show, which has me feeling blue. The paint, look how it shines for you.